Logitek's newest console, the ROC, features durable construction and AoIP compatibility. 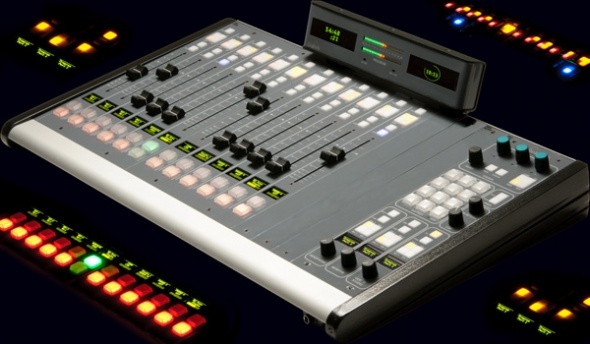 ROC is available in 6-, 12-, 18-, or 24 fader configurations with split-frames available. Reverse-printed overlay surface ensures no rub-off over time. The fader On/Off buttons may be set to any of 256 colors. Designed to handle any studio situation, Logitek's new ROC console brings easy operation, durable construction and the flexibility of AoIP to control rooms, production rooms and news booths. Available in multiples of 6 faders (up to 24), the ROC is housed in an attractive tabletop enclosure with 1/4" and mini headphone jacks mounted on the front rail. Available in multiples of 6 faders (up to 24), the ROC is housed in an attractive tabletop enclosure allowing it to be used anywhere – even in temporary studio setups. It includes high quality Penny & Giles faders, OLED source indicators and meters, and a suite of controls for leveraging the power of the JetStream AoIP platform. A basic ROC system comprises a 6 fader module and a central monitor module. The monitor module includes controls for source selection, timer start/stop, two monitor feeds and headphone output; it also includes 12 user-assignable softkeys that may be used for a wide variety of functions such as scene selects or triggers. The LED-illuminated softkey buttons may be set to any of 256 colors via software. The console can be expanded with additional banks of 6 faders, a separate 12-button softkey panel, and an onboard multi-channel router control panel with LED source and destination indication. An optional meter bridge displays program and switched source levels with dual OLED screens for timers, clock, profanity delay indication or user-defined text. The ROC may also use a VGA screen connected to the JetStream to display meters with the included vScreen software. ROC Fader Modules are available in multiples of six faders (from 6 to 24). User-definable 16-character source labels on bright, wide angle displays. Character display supports Unicode characters including Chinese and Kanji. The ROC uses efficient LED lighting with no light bulbs to change. Bus buttons assign Program plus 3 AUX sends per fader. Each fader has a change button, cue button, and softkey button that may be used for talkback or intercom. The console includes a built-in cue speaker. The ROC offers a central select knob for easy access to new sources, in addition to access to compression and EQ controls. Three "soft" knobs are available for use with the included vScreen PC application for VGA meter bridges. 12 configurable softkeys may be used to assign quick routes or any other function, and the buttons may be set to any of 256 colors via software. Preset buttons for headphones, control room, or guest/studio monitoring let operators quickly change between 4 sources, plus an unlimited number of sources may be monitored using the change button and select knob. Timer control buttons and talkback return and cue level knobs round out the module. The ROC's optional meter bridge gives you great visibility of your levels with one LED bargraph program meter and two tally LEDs. • One tri-color stereo LED bargraph meter simultaneously displays peak and average metering. TFT screens on each side of the LED bargraph can display auxillary busses, studio monitors, inputs, or any other mix. • Two tally LEDs. Use one to indicate the studio is on air and the other to indicate the mic is on, or to indicate the program is live in the next studio (ideal for multi-studio operation). • 12 programmable softkeys. Each button may be individually assigned any of 256 RGB colors via software.